"More than 1330 of Islamist fighters had entered Palestine," said a threatening email received by many Israelis on Thursday night. The message warned that several prominent people would be abducted and killed. "This is jihad, victory or martyrdom," it concluded. The message was sent in English, Arabic and Hebrew from an email account registered on Google's Gmail service, which enables any person to open an account for free without requiring identification. The exact number of people who received the message is unclear at the moment. It is also unknown whether the email was only sent to Israelis or to a wider variety of people. Many of those who received the message said it had been sent to their private email addresses which are unknown to external sources. Surfers reported of additional message which arrived in their mailboxes on Friday morning, expanding the text included in the original message and offering them to join the organization as spies. Some of the emails included shocking images and links to YouTube videos. The additional emails were titled "The End of Israel", and were sent by a person calling himself "Youth of Islam" from the address i.am.hitler2099. "The interesting thing is that I'm indeed an Israeli, but I live in New York. The email was sent to my hotmail account registered in California," said Ron from New York. Adam, another Israeli who received the message, was surprised to find it in his mailbox. "This is an address which rarely receives spam (junk mail), as it is only used for personal needs. I really don’t understand how they could have known this address belongs to an Israeli," he said. The email was sent on behalf of al-Qassam, Hamas' military wing, but since it was sent from an anonymous address it is unclear whether this was an official Hamas message or an enthusiastic supporter who decided to send the threatening messages of his own accord. The message was sent in a number of languages, and it appears that its senders used automatic translation services for the English and Hebrew versions as it includes many grammatical errors. This is not the first time Hamas or people on its behalf use electronic means in order to threaten Israelis. During the fighting in Gaza, many Israelis received threatening text messages on their cell phones and messages sent via the Skype software from the Palestinian organization. 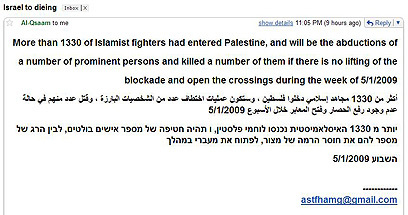 See all talkbacks "Israelis receive threatening email from Hamas "